At age 17, Eugene McGuire thought his life was over as he watched the gavel fall and heard the Judge pronounce his sentence: Life without the possibility of parole. But God was just getting started in the life of young Gene. What Eugene considered a curse, God intended to use as a blessing. A riveting, spellbinding read from page one, Unshackled: From Ruin to Redemption, tells the story of God at work in and through the life of Eugene McGuire. Sentenced to life without parole for a murder he did not commit, Gene McGuire had to face the demons wrestling for his soul as he served hard time in prison for nearly three and a half decades. Like any of us, young Gene was not a perfect individual. But he was no killer either. A night that started out as some boys out for a little fun went completely haywire. Before he knew it, Gene found himself in the wrong place at the wrong time involved in something he had no intention of taking part in but was at a loss to do anything about. As the story unfolds, we see God at work in Gene’s life, providing him with Divine Guidance and Protection, along with Divine Appointments and Interventions. In his autobiography, Gene McGuire reveals a testimony only the God of the Universe could orchestrate. The book is well-written by the first-time author and corporate pastor, and it moves along at a good pace. Honestly, you can sit down and read it in about two settings from cover to cover. It is not a particularly easy read, but rather an astounding story of the God of Miracles rescuing one of His lost sheep so that he could go on to be a blessing to others. Since first meeting Gene a little over three years ago in an ICU waiting room as we gathered to pray for a family whose lives had been tragically disrupted, I have seen his ministry grow and consider it an honor to call him my brother in Christ. The Lord has clearly raised Gene McGuire for such a time as this. 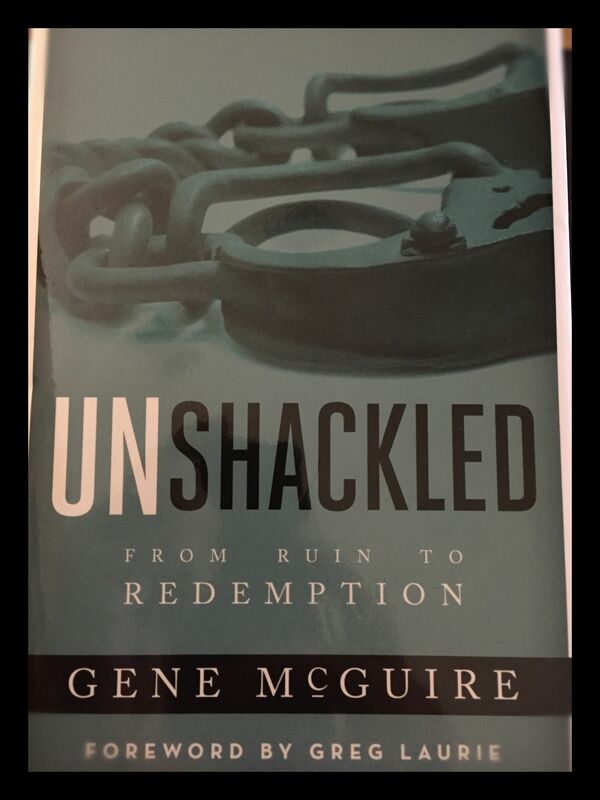 When you get the chance, I recommend you pick up your copy of Gene McGuire’s book “Unshackled: From Ruin to Redemption.” I promise you will be glad you did. You can purchase a copy of Gene’s book online at Amazon.